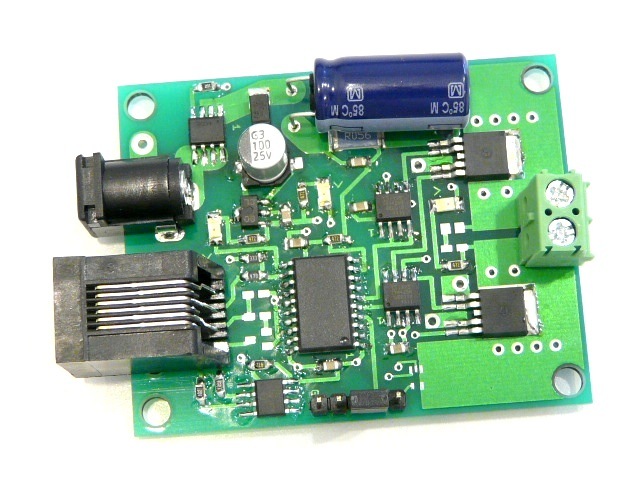 The DCCBoost is a DCC booster to power track or accessories. It has three modes. 1. Basic DCC booster mode. The DCCBoost output follows the DCC signal input. If the input DCC turns off for some reason then the DCCBoost turns off. 2. Accessory mode. The DCCBoost output continues to send DCC power regardless of the DCC signal input. This keeps accessories from shutting down due to track short circuits or over current conditions (fault). 3. Command station mode. The DCCBoost converts switch and signal messages on the serial bus from the CSC (Central Signal Controller) to DCC packets to control the SHD2. It also powers the SHD2 and other compatible accessories. The DCCBreak requires a 12 to 14 volt DC power supply. The maximum continuous operating current is 4 amps. The over current shutdown is about 4.6 amps. DC power barrel connector is 5.5mm-x-2.1mm with center pin plus. Board size: 2.38" X 1.88"